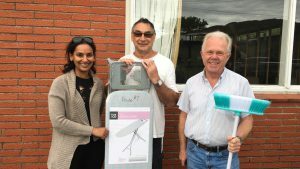 The Archdiocese of Wellington supports refugee resettlement by providing household and pantry items, and preparing homes for former refugees being resettled in Wellington. Since February 2016, working in partnership with the Red Cross and the Anglican Diocese of Wellington, we have prepared over 200 homes for more than 660 former refugees. This work was featured in a video prepared by Caritas Aotearoa New Zealand for Social Justice Week 2016. THANK YOU to everyone who responded to our request for assistance with tools for a former refugee working as a builder. Thanks to everyone’s generosity, this need has been met. Many thanks to everyone who responded. AUGUST 2018 INTAKE: We are currently looking for groups available to prepare household and pantry packs, to work as house set-up teams and checkers and sorters in the week of 12 August 2018. Prepare a household pack: Groups sign up to prepare and deliver a household pack for a former refugee family arriving in Wellington, from a prepared list of required goods. This includes items such as bedding, cooking gear, cleaning gear, crockery and cutlery. Prepare a pantry pack: Groups sign up to prepare and deliver a pantry pack of non-perishable items for a household of between 1-6 people. Please note that Catholic social services is unable to collect household items, and has very limited storage capacity. We ask groups to prepare a complete household or pantry pack to be delivered on a set collection day. If you have household goods to donate outside these times, you may wish to donate to the Society of Saint Vincent de Paul.